Its beautiful clusters of colorful flowers are obviously an attraction! 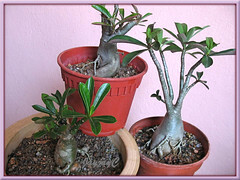 But it is the uniquely-shaped swollen bases of Adenium obesum that have always fascinated us, though we never had a strong urge to own one. However, sometime in December 2005 we decided to add a seedling about 13cm tall to our garden. To our disappointment, it was so slow-growing, hardly increasing upwards, sidewards nor developed a swollen base as expected. Such slow-growth can be quite depressing if one is impatient to see results. Even though new leaves emerged as the older ones are shed ever so frequently, a single non-blooming spindly stem that is sometimes almost devoid of leaves is so unappealing. It looked so gorgeous the first time around that we could not resist but got ourselves another 2 seedlings of the dwarf variety a few months later. They are a year-old now, not flowered yet but the swollen bases are distinct and lovely. Hehe, at least we get to delight in the beauty of their caudex for the moment. 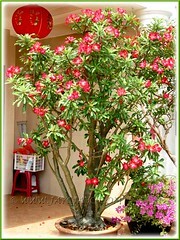 Recently, we saw a beautiful potted Adenium obesum shrub about a meter tall with overflowing dark-red blooms at someone’s front yard. It was so captivating and inviting. Many a time, as we drove past that house, I was tempted to request a shot of it from its owner, but John, my beloved spouse did not support the idea. Aargh, otherwise I could have shared a picture here! We have never seen a shrub that tall and so beautiful before, wonderfully multi-branched and abundantly filled with foliage and flowers! An amazingly stunning shrub indeed! Make us want to get another, but definitely not a dwarf variety again! 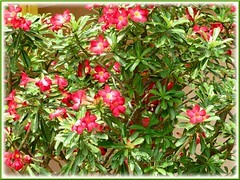 Plant type: Succulent flowering shrub or small tree, native to Eastern Africa and Southern Arabia. 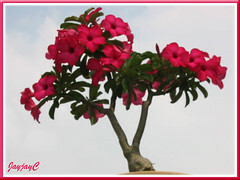 Features: Adenium obesum is a succulent perennial shrub/small tree that can reach 1-3m tall, though most cultivated hybrids and varieties grow between 0.5-1.5m tall and bonsai, much shorter. It is a highly variable species, ranging from slow to vigorous growth rate, producing either a single thick fleshy trunk/stem or a multitude of succulent stems (that emerge naturally or aesthetically by tip-prune), grey or greyish green in color. 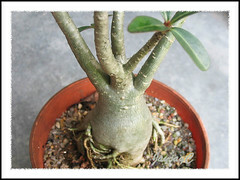 Most plants, especially the seed-propagated ones, will develop the characteristic stout and swollen trunk at the crown called caudex that becomes larger with age, each individual uniquely shaped and no two plants are identical in shape and structure. Absolutely amazing! It bears glossy and leathery dark-green leaves (even variegated leaves are seen now) that are spirally arranged and clustered at terminal stems, of variable shapes and sizes – some lanceolate and tapering, others are obovate and bluntly tipped, ranging 5-15cm long and 1-8cm broad. A semi-deciduous shrub with leaves falling, sometimes completely defoliated, depending on the climatic conditions, moisture stress or care received. Nonetheless, new leaves will re-emerge as easily on extended growth with tender loving care! 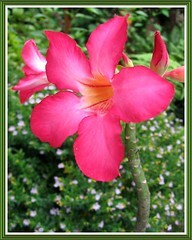 Attractive 5-petaled bell-shaped or tubular flowers of varying sizes are borne at stem tips, in clusters of 3 or more. Some hybrids even have double flowers. 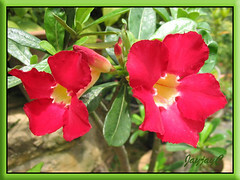 Flower colors previously were toned pink to red with a whitish blush radiating outwards from the throat or reddish-pink to white suffused with pink. 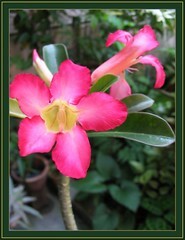 Now, with the extensive hybridization of Desert Rose in China, Taiwan and Thailand, there is a wide range of exotic color combination, variegation and pattern – in varying hues, either pure or bicolor, from white to cream, light to dark pink and magenta, or rose-red to very deep red, orange and even purple. Some petals are even ruffled or sharp-pointed and even lily-like. Really exclusive! Desert Rose also yields apple-green bean-like seed pods that are thin and long, containing seeds that are used for propagation. 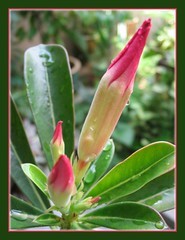 Blooms of unrelated plants have to be pollinated by the Oleander Hawk Moth for a seed pod to develop. Properly cared, the medium to large conventional-sized shrubs especially, will be excellent producers of abundant flowers year round. Culture (Care): An easy-to-grow succulent plant that needs minimal attention. Nevertheless, with the right care, it not only gets larger and more spectacular, but more valuable each year. A large and older multi-branched specimen with lots of flowers and a huge caudex can cost a ‘bomb’ at our local garden centers! Light: Full sun or bright light for best growth and flowering, but can take to light shade or filtered sunlight. It is happiest with sufficient warmth, sunlight and fresh air. Moisture: Moderate water regularly. It needs more water during hot weather but avoid over-watering as it is prone to root rot. On the other hand, insufficient water can cause leaves to fall. Allow soil to dry completely between waterings. It is drought resistant in cooler weather. Some subspecies are known to flower abundantly with period of dryness following period of wetness. Soil: Any garden or potting soil with a mixture of coarse sand, crushed granite, gravel or brick chips that is free draining yet able to hold moisture and nutrients. 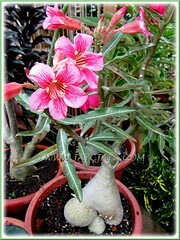 Others: Desert Rose are heavy feeders. Feed fortnightly or once monthly during growth with a water-soluble fertilizer at half-strength. Using a phosphorus-based fertilizer, together with a good-draining media in a pot-bound container will most certainly increase caudex formation and enlargement. Even varying between moist and dry periods can help caudex development. When plant has outgrown its pot size, transplant it to a slightly larger container, planting it slightly above the previous soil level to expose more of its bulbous caudex and roots, providing room for their expansion above ground. Nonetheless, it can tolerate being pot-bound. Start styling the plant when young by pruning the new shoots regularly to encourage multi-branching. More branches mean more flowers! Do this by either removing the smallest two leaves at the tip or cut an inch or more from the tip of the stem, be careful though to avoid contact with the poisonous milky sap that can cause skin allergies. To maintain its attractiveness, best to also prune off any small roots emerging from the caudex region but not those fine feeder roots below the caudex. Watch out for caterpillars, mealy bugs and mites that can destroy or retard its growth and flowering. 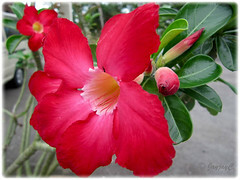 For subtropical and temperate regions: Hardiness: USDA Zone 10a-11 Check info at Dave’sGarden and read what other growers/lovers of Desert Rose have to say. Water sparingly during winter months but increase water during active growing and blooming in hot seasons. Propagation: By seed, stem cuttings or air-layering, though numerous hybrids are propagated mainly by grafting onto seedling rootstock. Seed-grown plants will easily develop the characteristic fat swollen trunks (claudex) that cutting-grown plants rarely will achieve. Seeds scattered into a mixture of sand and soil germinate easily. For propagation by stem cuttings, cut end shoots being mindful of the toxic sap, and allow them to dry for 2-3 days before planting them into a potting mixture of sand-peat, and keep the soil moist. 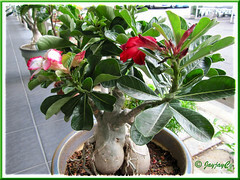 Usage: Adenium obesum makes excellent container plant, any kind whether plastic, ceramic or clay pots is ideal. The shrub can be grown in the ground too as an ornamental standard specimen. 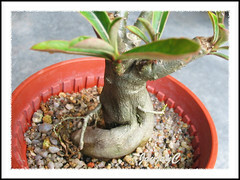 Some hybrids or cultivars can be grown as Bonsai. The dwarf hybrids can be located indoors as houseplants if grown by a window, receiving sufficient heat, sunlight and ventilation. In some regions, the highly toxic sap of the plant is used as arrow poison for hunting and known traditionally too for its medicinal properties. More info at PROTA site. 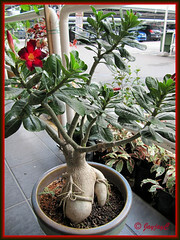 Caution: Various parts of Adenium obesum or Desert Rose are poisonous to humans and animals. It exudes a highly toxic sap which is used to make poison arrows for hunting game in Tasmania and Africa. Do not ingest anything from this plant. Take precaution when handling and pruning it. Wash hands and area of skin immediately and thoroughly if there’s contact with the poisonous sap. 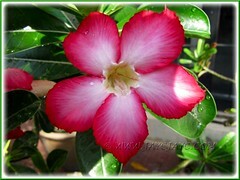 I have a desert rose and have started to collect information on this plant. We have decided to start growing these also. 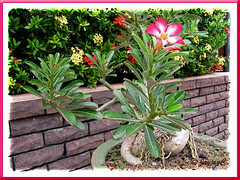 Their is a lot of information on the web under the name Adenium Obesium. Where did you get your seeds? We are trying to locate suppliers and have found a few but they haven’t responded yet as I just found them yesterday. I hope you all of the sucess. We are in Phoenix,Arizona. Hope to here from you. We can exchange info on our progreses. Hi David! Our plants were not seed-sown but young ones bought from garden centers. All the best in your search though. Just saw this plant at our local WalMart and needed to have it. I am in AZ but higher than Phoenix, at 3500 ft, where we do get killing frost from mid-November through about mid-April. I am about to bite the bullet and move my plant from my shaded front deck to full sun but I am going to watch it and move it back if our sun is too strong for it. I am wondering about winter. The instructions that came with it do not consider it an outdoor plant at all and say it needs a bright sunny room 24/7. I don’t really have a bright sunny room for it and I am wondering if it can overwinter in a south window. I could take it to my office for the winter where it would get little sun but broad spectrum fluorescents during working hours. Anybody have an opinion? I puchase my seeds on ebay and now I have over 80 adeniums around my house. I realized that if you plant few month old baby plant in the ground it can grow great in the ground and very fast too! I buy unique colors of seeds, mix them up and plant them, and when they flower I always get surprised with colors because I never know which plant will be which color. LOTS OF FUN !!! Best seeds are seeds from Thailand that are sold on ebay. I get 99% germination rate. 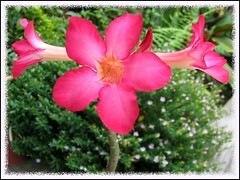 I am moving from LaPaz, Mexico to Tonto Basin, AZ and have to leave my wonderful desert rose plants behind (sigh). I’m interested in starting some of them from seed, but also want some small plants purchased from the Tonto/Phoenix area – can you recommend a garden center/nursery in the area? What type of soil do you use for germination? I have recently purchased some seeds from ebay and am anxious to get them started! Wow! I can just imagine how magnificent they are, Andy! Thanks for your insights and offer of assistance. Ebay is a good palce to look for seeds. 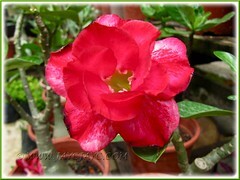 look at kingadenium’s web site, he has one on e-bay and 2 regular ones. After buying 7 diffrent kinds of seeds on E-Bay, I came across his website, anyway to make a long story short alot of the diffrent types of being offered on e-bay are fake, altered photos ect. Some of the colors don’t even exist and are actualy stolen from other websites altered and the items are posted on e-bay, so watch out. I will grow the ones I got from seed and do a comparision of what I bought vs. what it is. 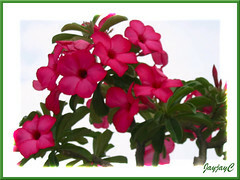 Thanks for introducing kingadenium’s website. We’re truly amazed at the awesome varieties presented in his photo gallery and had included a link to his site. my Desert Rose is infested with orange worms which carry tiny black legs, How can I get rid of them w/o the use of pesticide. We live in Riyadh KSA where the winters can go as low as 0c and summers into the 50c real desert conditions. Our Adenizum Obesum has grown to about 1,5m high within 4 years from a height of approx 40cm. It’s kept outside in semi shade – ie beneath a huge date palm – as seems to enjoy this. Our biggest issue is dust, genuine issue here in KSA, on the leaves. Can you advise how best we deal with this beside regular fine hosing? Yes, Jose…. they exude a highly toxic sap. I’ve highlighted this issue in our post under ‘Caution’ as a gentle reminder. Thanks for bringing it up. I have just started my addiction to these plants. I’m trying to get information on advantages/disadvantages of growing seedlings together to form a new plant. Have been told the 2 colors will stay separate. What happens to color on grafted plants over time? Does it ever blend? Any sites that I have not found for information ?